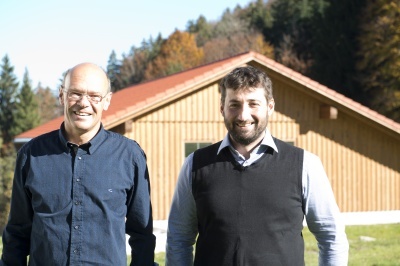 Berni and Hans-Hermann find inspiration in the formative, powerful nature of the Allgäu Alps: the extreme change of weather and seasons, the play of clouds with light and shade, the brightness of stars in the night sky and the fragrance of robust herbs in the mountain meadows. If you do not come across the two men at their original workplace, simply go further uphill to the alpine huts which are located in the lush mountain meadows, and have often already braved wind and weather for centuries. Here is the spot for a rest on a bench in front of one of the rustic huts. Leaning on a weathered wall, your gaze roams over the wide horizon towards the mountain peaks. The valley lies far below and a distance to the everyday, stressful things in life emerges automatically. Now you understand why our beer could only be called “Alms”! And if you are lucky, maybe Hans-Hermann or Berni are already sitting on a bench at another hut enjoying the moment just like you! Experience the natural summer freshness of an alpine meadow. Let yourself be enchanted by the wintry charm of a rustic mountain hut! Taste the special beer for the 500th anniversary of the German beer purity law!